The universal lyrics have provided a lasting message ever since, and they are once again relevant in the world of women’s rugby where the times are definitely a changing. 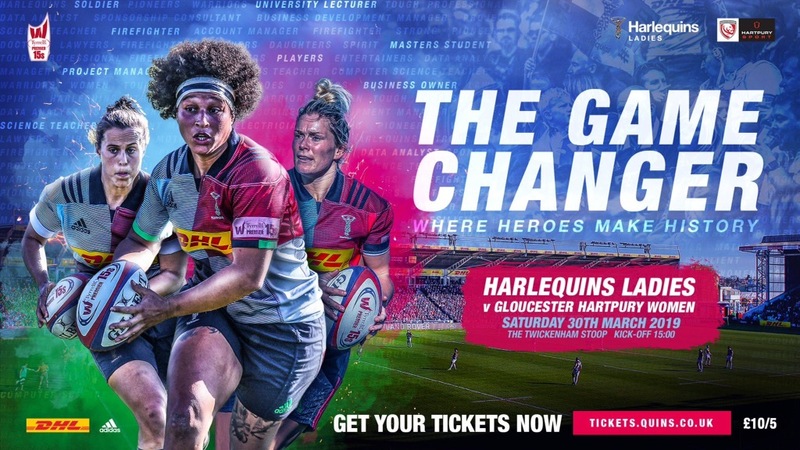 This Saturday at the stoop we have the game changer, Harlequins Ladies v Gloucester-Hartbury, an occasion that underlines just how far the women’s game has come and how it continues to grow and improve on almost a weekly basis, as underlined by the 13,000 crowd that watched the Red Roses face Scotland a few weeks ago across the road at Twickenham. The United Nations of the game will be on show at the weekend, Quins are the home to Red Roses, Flowers of Scotland , a star spangled flanker and a Wallaroo, if you add in the Swedish, French, Irish and Welsh contingent then you really have a Noah’s ark of world rugby. The women’s game has changed beyond recognition over recent years standards on and off the field are continuing to sky rocket. Harlequins are at the vanguard of the revolution they continue to break new ground on and off the field whilst maintaining the rugby values we all cherish, which is not an easy task, rugby is no longer a man’s game and young girls and women have idols and role models of their own. The glass ceiling has not been broken at Quins it has been shattered to smithereens, a doctor, firefighter, Met Police chief superintendent and soldiers all line up together on the field of play, inspiring youngsters both on the pitch and in their day jobs. Quins warmed up at the weekend infesting Sharks waters with a 76-12 over the Darlington Mowden Park outfit, providing a scintillating display that all but guarantees them a home Tyrrells Premier Semi final. Everyone is up for “The Game Changer” and I can promise you a feast of rugby, and for those who have enjoyed the women’s Six Nations, you will be able to see stars of England, Scotland and Ireland from that tournament up close and personal, with the opportunity for a chat, autographs and even photos at full time. Saturday will be an affirmation and celebration of how far womens rugby has come, and how far it has the potential to go, those that continue to scoff at the women’s game are getting quieter and fewer, there is no going back now, and I leave the last word with Bob Dylan himself. See you at the Stoop.